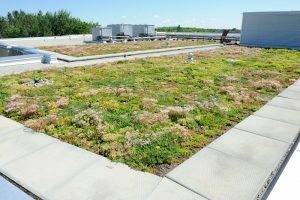 Vegetated roofing has long been recognized as an effective stormwater management tool in urban centres to help store and attenuate runoff from impervious rooftops. New technological advancements are helping further increase stormwater retention capacity on rooftops while keeping weight low. One such significant advancement is the use of rock mineral wool (RMW)—which offers both advantages—in place of a greater depth of traditional growing medium. There are several varieties of mineral wool on the market, produced for different applications. When it comes to stormwater retention and vegetated roof survivability, not all mineral wools are created equal. Mineral wool is a general term for a light, artificial wool made of an inorganic substance such as glass, stone, or slag. It was originally invented in the mid-19th century for thermal and acoustic insulation in the construction industry. Almost 50 years ago, a modified form of RMW in the form of slabs, blocks, and bonded fibres started being used as a substrate in hydroponics in Denmark. (For more, read the 2002 article, “Substrates and their Analysis” by M. Raviv et al., published in D. Savvas and H. Passam’s Hydroponic Production of Vegetables and Ornamentals by Embryo Publications in Greece.) Today, it is present in virtually all advanced horticultural markets, and is used for growing hydroponic fruits, vegetables, herbs, and flowers. RMW for vegetated roofing applications is manufactured by a fiberization process induced by heating a mixture of various rock components (usually diabase, dolomite, granite, basalt, etc. ), which are melted together at high temperatures. (Further information on mineral wool production can be found in B. Širok et al.’s 2008 publication Mineral Wool Production and Properties from England’s Woodhead Publishing Limited.) The melt is spun into thin fibres on fast-rotating machines and is later bound for dimensional stability. Advancements have been made in the manufacture of mineral wool over the decades, offering environmental alternatives and products with superior performance. One development has been the use of formaldehyde-free binders, which rely on renewable resources. This new generation of mineral wool is an environmentally responsible alternative to phenol-based products. It uses renewable resources for binding agents and has enhanced water absorption characteristics. The most notable development is the production of the needled rock mineral wool, the Needled Mineral Hydro Blanket, Hydro Cubes and Hydro Flocks, manufactured without additives or binders. Hydro Cubes and Flocks are designed to be mixed with traditional growing media to increase rainwater holding capacity. Flocks and Cubes are recommended for containers, patios, and ground level landscaping and contribute to better soil structure, water-holding capacity, and aeration of growing media. It is important to understand how this engineered product supports long-term stability and stormwater retention performance in outdoor applications such as vegetated roofing. 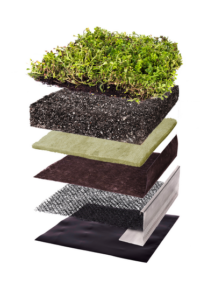 Needled rock mineral wool can be ideal for vegetated roofs, as it acts as a water reservoir and supports plant health, replaces heavy growing media, and performs exceptionally as a rooftop stormwater management tool throughout the lifespan of the vegetated roof. Installation of Needled Mineral Hydro Blanket on Camden, NJ school rooftop. Various types of RMW are currently available, each complete with its own unique advantages, drawbacks, and properties. They are those that use 1) traditional chemical binders, 2) bio-based binders, and 3) needled or binderless RMW. The latter is the most recent innovation in RMW. Below are details why binderless RMW is ideal for vegetated roofs. The most common mineral wool on the market is sprayed or bound with phenolic resin or diluted phenol-formaldehyde (PF) for dimensional stability. These binders also help make the product water-repellent. This type of mineral wool is typically used as insulation in the construction industry. 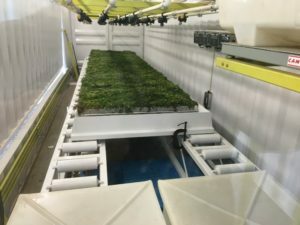 When traditional mineral wool is modified with a hydrophilic (or wetting) agent, it can be used as a growing media for hydroponic cultivation in a strictly controlled environment. 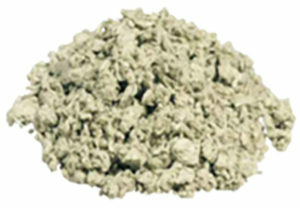 If this type of mineral wool is used as an alternative to other growing media, it requires uniform conditions such as a greenhouse where usage cycles tend to be relatively short (i.e. from one growing season to five, in the case of ornamental plants). If it is exposed to any varying, uncontrolled climatic conditions (e.g. dry/wet periods, freeze/thaw cycles, or high/low temperatures) for longer periods, its water-holding characteristics will change significantly, resulting in decreased hydrophilic ability. In other words, cycles of drought or precipitation will negatively influence the material’s long-term performance and its water absorption capacity. This phenomenon likely occurs due to the hydrophilic agent rinsing out, which causes the initial hydrophobic character to prevail. Therefore, traditional mineral wool is not ideal for outdoor applications such as vegetated roofing. Its hydrophobic propensity renders it an inconsistent and unreliable stormwater management product over time, unable to effectively sustain rooftop plants under significant stress in hot and dry seasons. 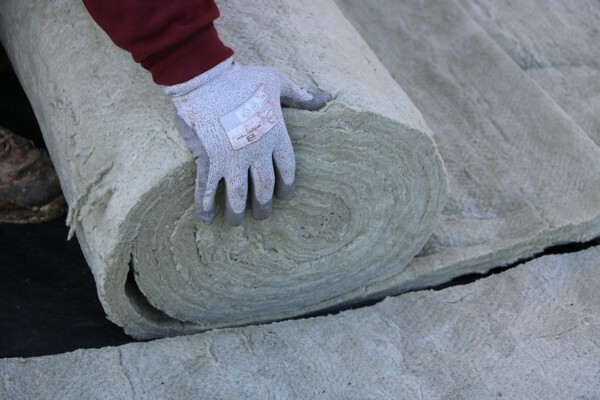 A new generation of mineral wool providing a solid alternative to the traditional variety has been invented and commercialized in the last decade. Bound together using a bio-based technology, this mineral wool is free from formaldehyde, phenols, and acrylics and uses no additional artificial colours, bleaches, or dyes. This reduces harmful manufacturing emissions and workplace exposures, improving the overall sustainability of buildings into which the product is incorporated. However, as with traditional mineral wool, bio-based binders will typically render the mineral fibres hydrophobic. A hydrophilic agent must be added to improve the hydrophilic capacity of the material. While mineral wool with bio-based binders will retain more water than phenol-based mineral wool, its long-term water absorption capacity decreases, as it does with the phenol-based variety, due to the flushing of the hydrophilic agent during periods of drought and precipitation. Fig 1. Needled rock mineral wool without binders—virgin material (SEM analysis, zoom 1000x). The most recent advancement in this industry is the manufacture of needled rock mineral wool—a non-petroleum-based and formaldehyde-free alternative. Products made this way are known as Needled Mineral Hydro Blanket, Cubes or Flocks. The needling process provides dimensional stability without the use of any binders—mineral wool is formed by a mechanical interconnection of pure mineral fibres. This process forms a structurally stable, lightweight, and porous material with longer fibres (Figure 1) that can maintain excellent water-holding properties. It is consistently hydrophilic, even after varying weather cycles throughout the year. The material can hold 90 per cent of its volume in water. When wet, the majority of the retained water is easily available for plants’ uptake. (This was tested by pH curve. The authors can provide data upon request.) A minimum of 10 per cent oxygen is left in the needled mineral wool, enough to support the oxygen levels in the root zone and, therefore, healthy roots. 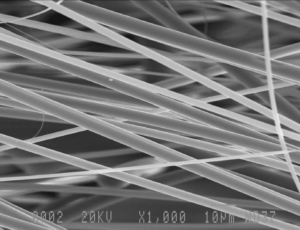 The material is inert, with chemically stable fibres. 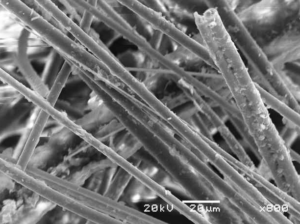 On the left side of Figure 1, the condition of fibres three years after installation is shown with soil particles attached. The hydrophilic characteristics of the Needled Mineral Hydro Blanket can offer long-term stability, as nothing rinses away. The physical attraction between fibres and water remains the same throughout the lifetime of the product. Binderless mineral wool offers hydrophilic characteristics that better support root growth and overall plant health, making particularly suitable for many vegetated roof applications, with long-term survivability in various climatic zones. 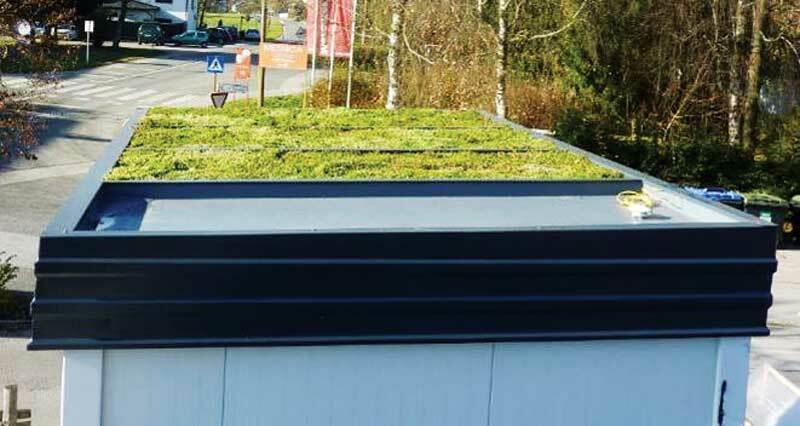 • It performs exceptionally and reliably as a rooftop stormwater management tool throughout the lifespan of the vegetated roof (as seen on Sweden’s Karolinska University Hospital, Rentenversicherung headquarters in Berlin, and various projects throughout Baltic and Scandinavian countries). Needled Mineral Hydro Blanket comes in a roll and has a density of 286 to 319 lb/35 cf. 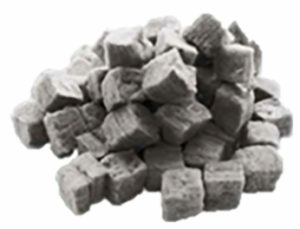 It is also available as Hydro Cubes (0.8 x 0.8 in) and Hydro Flocks (0.1 to 0.8 in.) and is recommended for containers, patios, terraces and ground level landscaping applications. Cubes and flocks are added to a traditional growing medium and contribute to better soil structure, water-holding capacity, and aeration. The retained rainwater inside the Hydro Cubes or Hydro Flocks is easily available for plant uptake and improves plant survivability. Fig 4. Stormwater testing lab in Virginia. Vegetated roofs constructed with binder-free needled mineral wool are tested and have been applied in various climate zones from moderate to extreme. Going forward, the focus continues to be on stormwater performance in retention testing, where vegetated roofs with a needled mineral wool layer are compared to traditional, engineered-growing-media-based vegetated roofs. One stormwater testing laboratory in Virginia (Figure 4) uses custom technology to apply replicable computerized rain events mimicking real-life rain events to evaluate assemblies 80 sf in size. 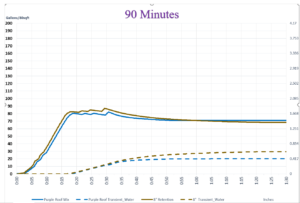 In Figure 5, the quantity of water retention and transient water is shown as measured on those samples in 90 minutes. 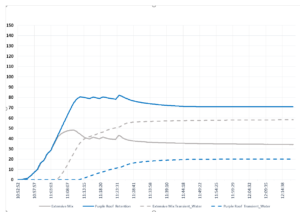 Full and dotted blue lines represent the values for a vegetated roof with a binder-free needled mineral wool layer, which is nearly doubled in stormwater performance compared to a 4-in. vegetated roof with traditional engineered growing media only (shown with grey full and dotted lines in Figure 5). The mineral wool layer does not significantly affect the dynamics of the release, but strongly influences the quantity. Technological developments in needled or binderless mineral wool over the last decade have focused on increasing water retention and maintaining long-term performance. Needled mineral wool’s characteristics better support root growth and overall plant health in various climatic zones, from hot and arid to frigid and wet, whether used in indoor applications such as urban farming or outdoor applications such as landscaping or vegetated roofing. Having been used in Europe for the past decade—with the largest projects being in Scandinavia, the Baltic States, and Germany—needled mineral wool has recently become available in North America, providing American designers and engineers a viable solution to landscaping in arid areas and increasing the stormwater management capacity on rooftops where this would otherwise be impossible. To help design/construction professionals more effectively create vegetated roofs, various manufacturers are introducing new tools and software to the industry. 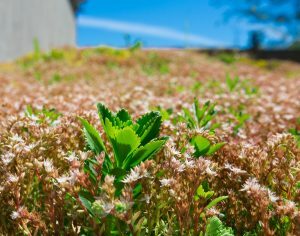 In collaboration with the Faculty of Mechanical Engineering’s Laboratory for Sustainable Technologies in Buildings at the University of Ljubljana, Slovenia, one company has developed a performance evaluation tool as a result of a two-year in-situ performance study of different types of vegetated roof systems. This tool helps assess the real performance of a defined roofing system in any city in the world or in different climate zones. The University of Ljubljana test and evaluation has been ongoing since 2014, and the initial two-year results have been used to create a software package intended to help current and potential users and owners of extensive vegetated roofs understand the real performance they can expect. As well as vegetated roofs’ stormwater performance, this software provides data on how such roofs can improve buildings’ energy performance and how they can reduce heat island effect. 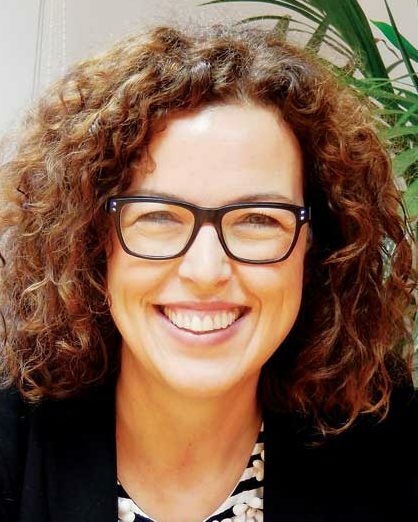 Darja Majkovič is the head of products and applications in green solutions at Knauf Insulation. 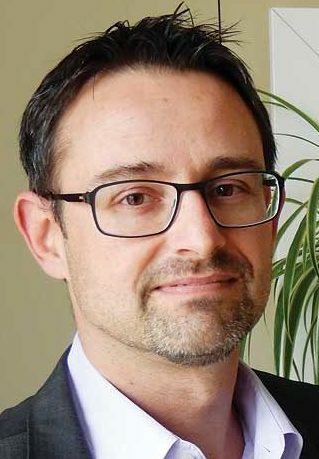 For nearly a decade, Majkovič was a researcher at the University of Maribor, focusing on agricultural economics and econometrics. 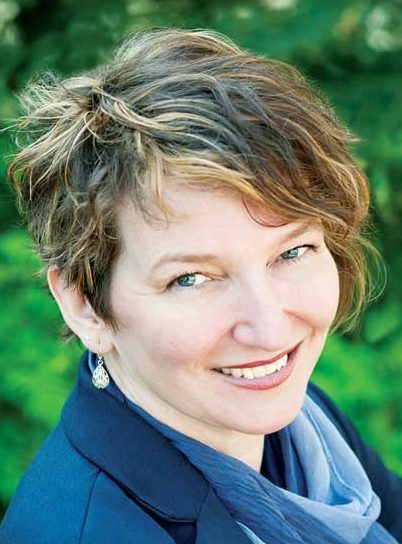 Her work includes collaboration on numerous national and international research and development projects. 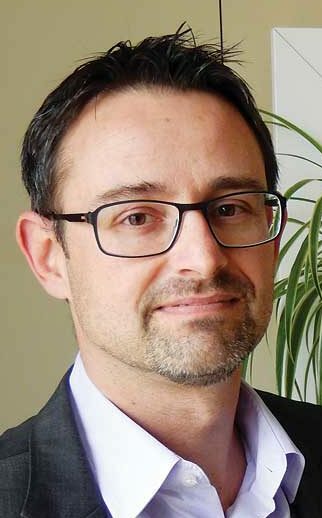 Majkovič was a visiting researcher at the French National Institute for Agricultural Research (INRA) and a university lecturer, and has written more than 160 articles. Jure Šumi is the business development director at Knauf Insulation, leading several teams. These include “Urban Green Infrastructure,” which focuses on developing lightweight green roof systems for stormwater management, “Landscaping and Gardening,” which focuses on developing substrates and systems for water conservation in arid climates, and “Horticulture,” which focuses on developing environmentally responsible hydroponic alternatives. Šumi has more than 20 years of experience in business and market development for multinational companies in a variety of sectors. Cristina Senjug serves as the communications manager at Stormwater Capture Co.
Stormwater Capture Co prides itself in being a hassle-free, one-stop-shop supplying vegetated systems that can be customized to local requirements, with warranty and maintenance support. We also offer ​access to a variety of analytical support service​s such as ​stormwater calculations specific to location ​and building/roof type. Contact us 855-786-7626 or send drawings to info@stormwatercaptureco.com get an estimate for your project. Copyright © 2017 Stormwater Capture Co. LLC. All rights reserved.